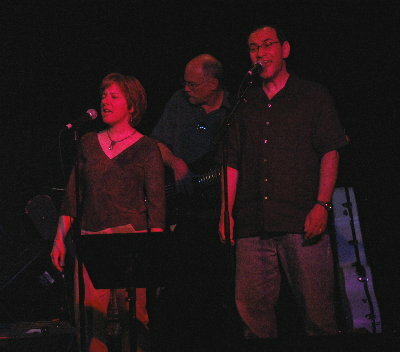 The summer has been packed with fun performances promoting the new CD, Soul's Engines. 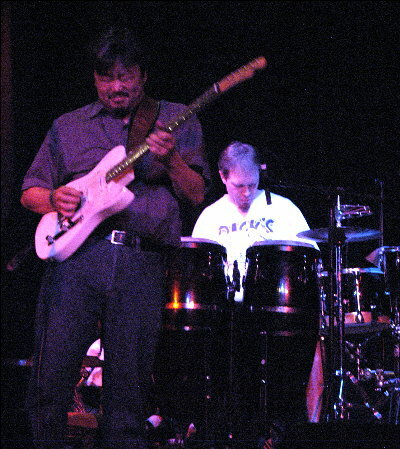 I've had a great combination of musicians including, Andy and Cheryl Winston, Rob Jeffrey, Chris Englemann, Rich Moore, and Doug Yoshimura. 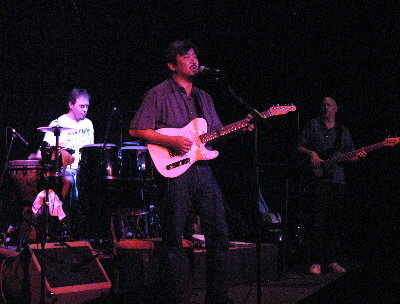 Shows included the Walnut Room, Swallow Hill Music Association, Highlands Square Street Festival and the Colorado Dragon Boat Festival. 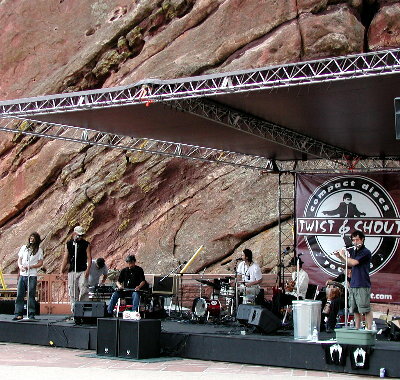 Photos below also include performances with Zebra Junction at Red Rocks for their sold out Film on the Rocks show featuring the movie The Princess Bride. 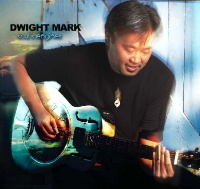 Dwight with his trusty mandolin "Marley" and a rare electric guitar version of "Dusty Diamonds", one of Dwight's first songs which he wrote and performed back in high school. 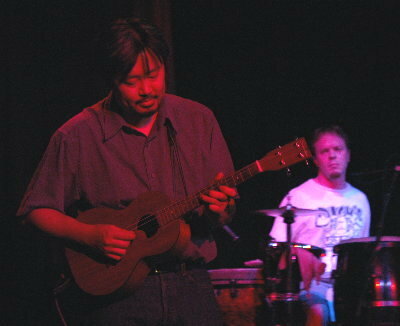 A ukulele version of "Good Thing", the title track from his first CD. 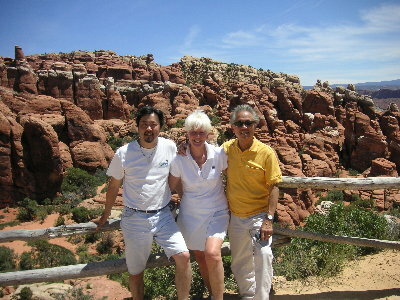 After the show, I headed up to Arches National Park with my parents. 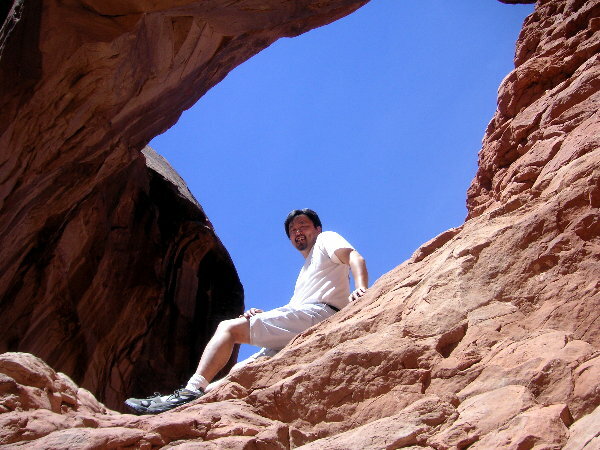 My song "Wide Open Spaces" was inspired by a drive to Arches when I first moved to Colorado nine years ago. 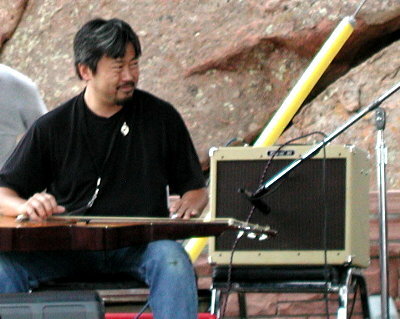 The song was recently selected to be included on the 2005 Colorado Bluegrass Music Society compilation CD. It has been a privilege to perform at one of Colorado's greatest festivals which celebrates the Asian community in Colorado. It truly was a multi-cultural event with over 85,000 in attendance. 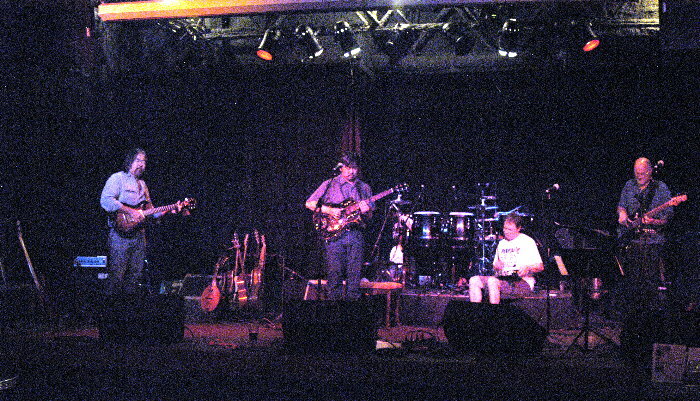 Zebra Junction has been gaining momentum with their continued featured airplay on KQMT 99.5 Mountain Homegrown Showcase. 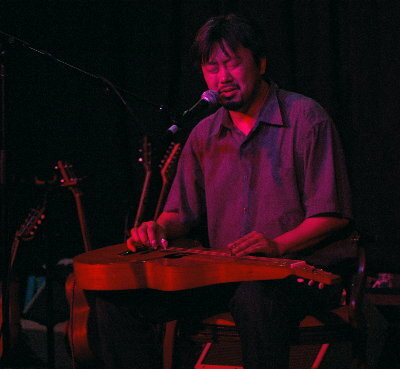 Dwight's performances on live shows and their new CD, Waterborne, featured his lapsteel, Weissenborn and mandolin playing. 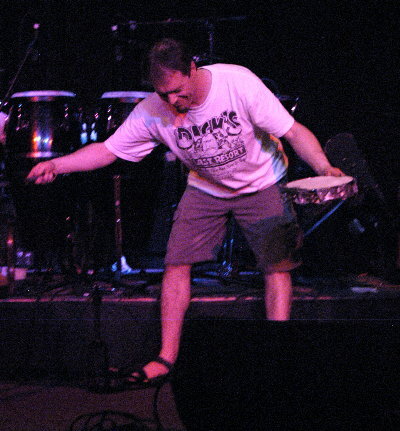 Click to listen to two live tracks recorded at the Marquis Theatre on March 30th which were broadcast on the radio. 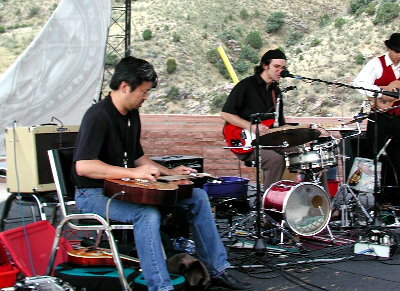 While these tracks feature a very-rocking style of Zebra Junction, the new CD tracks with Dwight feature two very folky tracks with Dwight on Weissenborn. 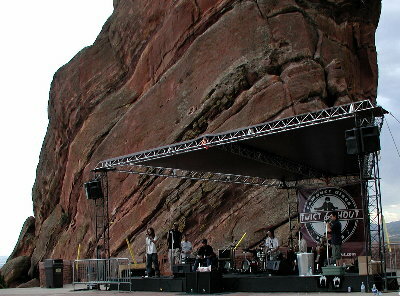 Opening for their "Film on the Rocks" series with a sold-out crowd for "The Princess Bride" turned out to be quite the windstorm which had banners, CDs, and gear flying across the stadium. In August, I moved from Arvada to the Historic Northwest Denver community of Highlands. 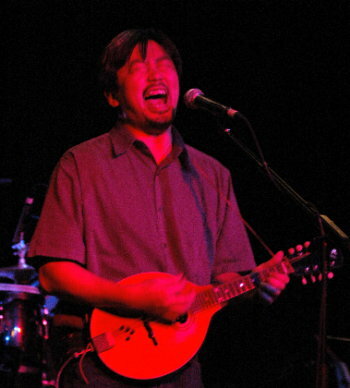 I will begin my own house concerts series featuring acoustic-based singer-songwriter performers across the country. 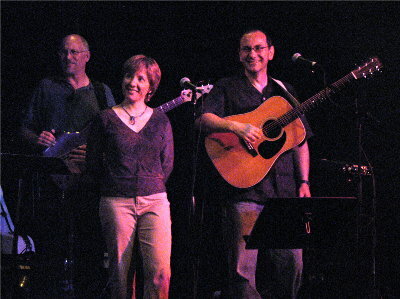 The first concert will kickoff with Nashville's Celeste Krenz on Sunday, September 18th, 2005. 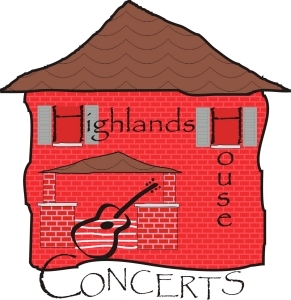 To find out more information about the Housewarming concert click here.